SURREY, BC – Fraser Valley Real Estate Board’s Multiple Listing Service® (MLS®) saw the highest number of real estate transactions ever recorded for the month of July. There were 2,184 property sales processed, an increase of 35 per cent compared to 1,615 sales in July of last year. The previous highest July was in 2009, with 2,089 sales and prior to that in 2005. Jorda Maisey is the Board’s President. “Home ownership is a passion in our country and in our region currently, conditions couldn’t be better to support that goal. Interest rates are the lowest they’ve been in six years, our provincial economy is on track to be the strongest in the country this year and in the Fraser Valley we have amongst the most affordable homes in the region. The Fraser Valley Board's MLS® showed 7,681 active listings at the end of July, a decrease of 20 per cent compared to the 9,636 listings available in July of last year. It received 3 per cent more new listings in July; 2,815 compared to the 2,724 new listings received during the same month last year. The MLS® Home Price Index benchmark price of a detached home in July was $621,100, an increase of 9.3 per cent compared to July of last year when it was $568,300. 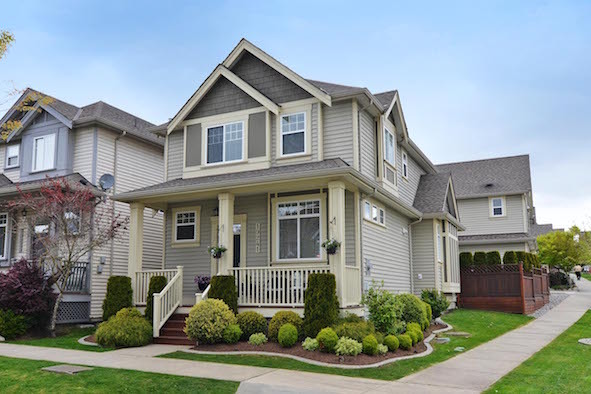 The MLS® HPI benchmark price of Fraser Valley townhouses increased 2.1 per cent going from $298,500 in July of last year to $304,900 last month. The benchmark price of apartments decreased year-over-year by 1 per cent, going from $194,700 in July of last year to $192,700 last month. Maisey adds, “Renters take note. Given interest rates and the affordable price of condos in certain neighbourhoods in Surrey, Langley and Abbotsford, it may be more economical over the long-term for you to own. There are excellent opportunities currently in the Fraser Valley for first-time buyers."